9/21/11, 8:59 p.m. He’s not dead yet. There are thousands of people trying to save his life, this Black man in a Georgia penitentiary, who has already served more than 20 years in prison. Troy Davis is a symbol of something much greater, a magnet for a deep rage, a deep and inchoate sorrow–the rage and despair of all those who rail against injustice. He is neither the first, nor will he be the last to be snared in the U.S. “justice” system and ground to a pulp. Clearly, his trial was a travesty of justice. Whether or not he killed a man in 1989 (a white man who happened to be an off-duty cop), certainly he has served his time, and just from looking at him you can see that he would not be the same man who walked through those prison doors 20 years ago. Isn’t the purpose of the criminal justice system rehabilitation? Or is it revenge, the vengeful inflicting of an eye for an eye? I would like to believe that if we go to the expense and trouble of housing, feeding and caring for a prisoner for 20 years, we’ve done it to accomplish more than simply warehousing him for his execution date. What is the point of that? As Bob Roberts showed so movingly in his memoir My Soul Said to Me, just about every convict has it in him (or her) to be rehabilitated. All it takes is someone who is focused on seeing the good, rather than insisting on the irredeemable. The Bard Prison Initiative, for example, is predicated on the assumption that every man behind bars is capable of learning, and will benefit from education. So many of the young men and women behind bars never had the benefit of a decent education–which might have put them on quite a different path. The Bard Prison Initiative, like Bob Roberts’ Project Return program for released ex-cons, demonstrates that justice does not have to wear an executioner’s hood. Sure, those who do wrong should be punished. But not forever. Very few criminals deserve capital punishment–and sadly, those who most deserve it often manage to escape (for instance, the masterminds of genocide in places like Guatemala, Rwanda, Bosnia….). What good does it do anyone to put Troy Davis, or many others like him, to death? 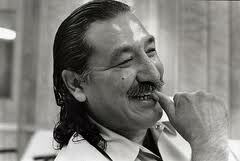 What good does it do to hold Leonard Peltier or Mumia Albu-Jamal in prison for decades? Doesn’t the criminal justice system want to do good?